Windows Registry Editor Version 5.00 [HKEY_LOCAL_MACHINE\SYSTEM\CurrentControlSet\Control\Nls\CodePage] "OEMCP"="850" [HKEY_LOCAL_MACHINE\SYSTEM\CurrentControlSet\Control\Nls\Language] "Default"="0809" [HKEY_LOCAL_MACHINE\SYSTEM\CurrentControlSet\Control\Nls\Locale] "(Default)"="00000809"
These instructions need a small correction to make them work. The following value name is (Default) and that is not the #3 value shown on the last screenshot in GPP. empty one (in reg file named as @) and with name “(Default)”. 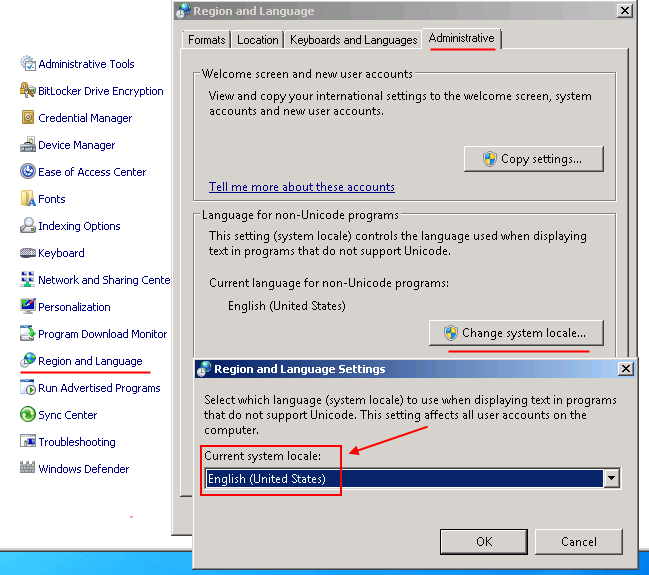 Control panel page make changes only in key with name “(Default)” – keeping empty named key unchanged. Tried this several times and in several ways, it never changes it from US to whatever locale I try to set. in a VDI environment this may not be possible.